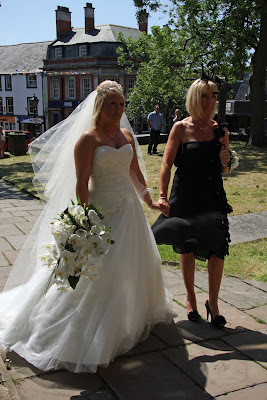 Chris & Claire's "Burnt Orange, Black & White" Wedding Day at St Chad's & Twelve in Thornton. 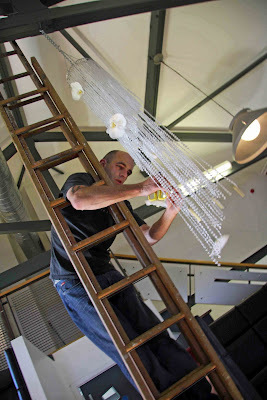 As usual on a Saturday morning Gary was up ladders, this time we're at Twelve in Thornton hanging our chandeliers loaded with Phalaenopsis Orchids, these had to be hung before tables were laid, Dawn from Creative Cover Hire was ironing the chair covers and Caroline & Dulcie were getting Twelve ready for the wedding. Then to the lovely Claire's house to deliver her Wedding Bouquet and the Bridesmaid's wrist corsages. She was seriously excited as you can see. 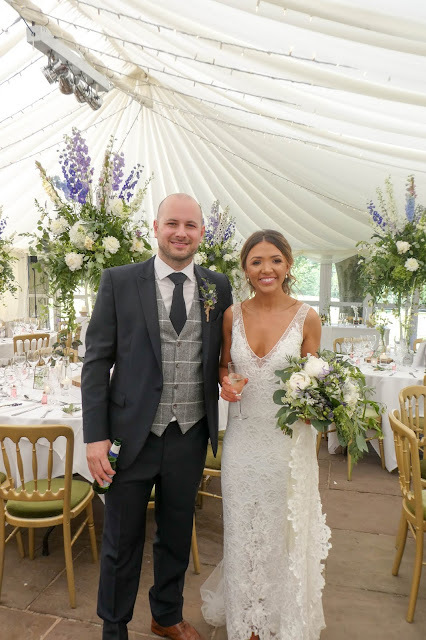 Claire's bouquet was created from White Phalaenopsis Orchids, Arum & Zantedeschia Crystal Blush and Stephanotis together with a selection of grasses. We had a few tears of joy. I designed very full wrist corsages for the bridesmaids and Deborah all with lovely Phalaenopsis Orchids. Claire's Bridesmaid's were totally gorgeous Sarah, Linda, Tina & Vicky and Flower Girl Elise These two young men Josh & Oliver were by far the most handsome men on the day, (they did wear shirts later on !). We made them both boutonnieres of Dendrobium & Stephanotis. And his Groom's Men James Sam & Philip, we made them Mango Calla Lily buttonholes. Geraldine "Groom's Mum" wore an ivory corsage of Callas, Phalaenopsis & Step hanotis. Best Man Simon really had his work cut out keeping Chris calm. The Choir directed by Kadria Thomas were absolutely amazing "Accord" they reallly did lift the roof, everyone was dancing in the aisle, clapping and singing along. 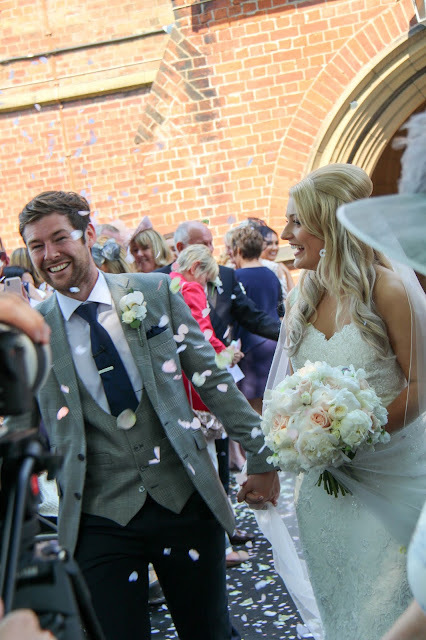 Massive congratulations to Claire & Chris, what a fantastic wedding! I adore a bouqet that can be flung around the shoulders of friends in great big hugs! Twelve is my personal favourite Restaurant on The Fylde, the food is special, contemporary and simply superb, the space is breathtaking and the management and staff are faultless . We arranged a series of glass and mirror cubes in varying sizes on mirror tiles, we used white Peonis, Mango Callas, Green Hydrangeas and Orchid heads. Love the detail of orange sugar rim on the toasting glasses, I have to say only at Twelve do we see this kind of detail and finish. Claire & Chris what an amazing wedding day Sally and I always knew it would be, from the minute we first met you 18 months ago in our office, we were all so giddy and excited discussing your plans and ideas, we wouldn't have dared hoped for such perfect weather but if anyone ever deserved a perfect day we know you certainly did! 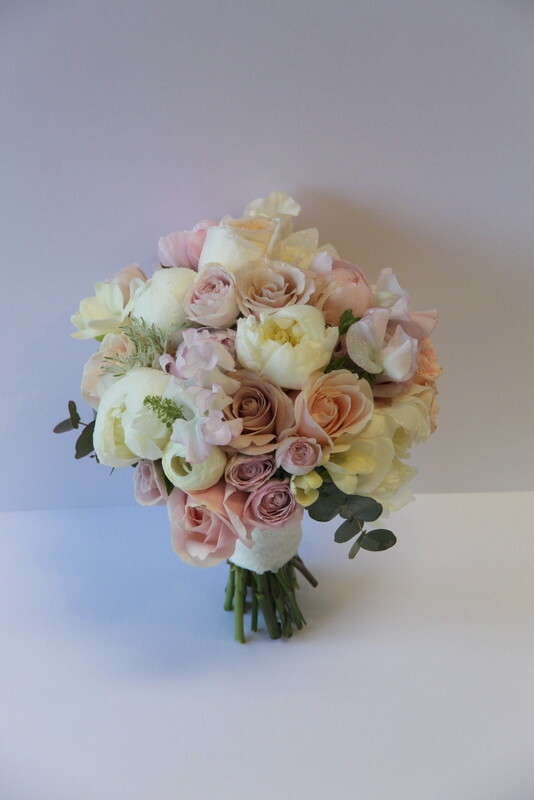 Thank you so much for allowing us to be part of your day, we enjoyed your joy and happiness and loved meeting all the family, have a wonderful life together and we look forward to seeing you at more Flower Design Events.